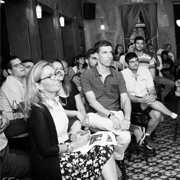 A festive event took place on Wednesday, 1 November 2017 at the Sheva venue in Tel Aviv to mark 20 years since the inauguration of the Kellogg-Recanati International Executive MBA program, a joint initiative of the Coller School of Management at Tel Aviv University and the Kellogg School of Management at Northwestern University in the USA. Prof. Sally Blount, Dean of the Kellogg School of Management for the past seven years and the first female dean of any of the leading business schools in the USA, made a special trip to Israel to attend the event. Together with Prof. Blount, we also had the pleasure of welcoming senior faculty members from Kellogg and the deans of the other schools in the Kellogg Global Network of international executive MBA programs. The focus of the event was the effort to prepare for the next 20 years of business management, to forecast the needs, the dynamics of future entrepreneurship and innovation, and the forms of collaboration between academia and business in a global world. Aharon Aharon, CEO of the Israel Innovation Authority, spoke about a vision of innovation that advances the economy and about the need to double the number of hi-tech employees in Israel to about half a million within the next ten years. Itai Kohavi said: “Peace needs a business plan.” He learned the three elements of the business plan in the Kellogg-Recanati program – goal, budget and human capital, and determined that in establishing his startup, based on research he carried out, that he would have to define peace as a business goal and create a process that will lead Israel to achieve peace by the year 2022. Two female executives, graduates of the Kellogg-Recanati program, Fiona M. Darmon, Partner and Chief Operating Officer at Jerusalem Venture Partners (JVP), and Amany Dahir, Director of Investor Relations at the Palestinian Siraj Fund Management Company, talked about building global bridges between nations and in the regional space, through business and technology. Scholars from Recanati and Kellogg engaged in ground-breaking research presented a glimpse into the future, which is in fact already here. Prof. Gal Oestreicher-Singer of the Coller School of Management, who researches the area of technology and information management, related to the changes in consumer behavior and to the fact that companies have started to make the transition to managing customers rather than managing products. 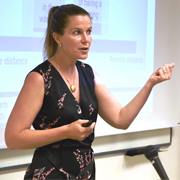 Prof. Moran Cerf of the Kellogg School, who researches the area of the brain and neuro-marketing, spoke about the ability to improve human capabilities and the brain’s decision-making functions, and on the future connection between man and robotics. Prof. Zviran announced the establishment of a scholarship fund to be named in honor of the late Prof. Don Jacobs, a past Dean of the Kellogg School of legendary fame who died on October 30, 2017 at the age of 90. Prof. Jacobs was Dean of the Kellogg School from 1975 to 2001 and it was he who established the Kellogg-Recanati program and initiated the cooperation between our two schools. Many senior executives and other people from around the world sent greetings to the Kellogg-Recanati graduates via video clips in which they shared their perceptions of the future. Among them were the journalist Thomas Friedman, Howard Tullman, an American entrepreneur and CEO of 1871 – a startup incubator in Chicago, Ajay Nanavati, a past senior manager at 3M, and more. In addition to the graduates of the Kellogg-Recanati program who made presentations at the event – Fiona Darmon, Tzahi Weisfeld, Amany Dahir and Itai Kohavi, many other executives and business people who graduated the program over the years participated in the celebration. Among them were Adi Soffer Teeni, CEO of Facebook Israel, Yoav Tzruya, Partner at JVP, Chanoch Barkat, Chairman of Dualis, Avner Stepak, one of the controlling shareholders in the Meitav-Dash investment house, Andrew Danos, of the James Richardson Group, Rocha Levin, Director of Real Estate in Globalvestment in the Teddy Sagi Group, Zeevi Bregman, Chairman of Galil Software, Racheli Ganot, CEO of Rachip, Limor Beker, Managing Director of the activities of Hamilton Lane in Israel, Advocate Tamir Gilat, Moshe Brauner, founder of Gold-Bar Engineering, Ami Boehm, Partner at the Fimi Fund, Jonathan Berger, CEO of the Kitchen FoodTech Hub, Ohad Zuckerman, Managing Partner at the Copia Venture Capital Fund, Danna Stern, Manager of the Yes Studios, Adi Mimran, Chairman of Smart Drive, Nadav Kadar, a senior Vice President at BrainPOP, Avi Ortal, Managing Partner at the Sky Fund, David Block, CEO at Sarine Technologies, Oded Chodorov, VP Business Development at Diesenhaus, Tali Vengosh Biron, CEO, Mommy Care, Carmela Avner, VP Global Operations & CIO, Strauss Water, Hilla Yohanan, CEO, Avi Cranes, Elhanan Yahav, CEO, Kidum, and more. Graduates of the program from all around the world came to participate in the event – from India, the USA, Europe. We also had 19 participants who are currently students of the Kellogg program in Germany. Peking University’s Guanghua School of Management.